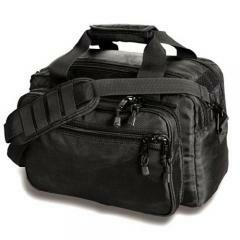 Keep firearms and other gear protected with the durable Side-Armor Deluxe Range Bag from Uncle Mike's. Crafted from incredibly rugged 1680D x 1680D Side-Armor® material with a water-resistant coating, the range pack is designed to withstand wear and tear of daily use. The bag features a roll-up flap with a double zipper over the main compartment for quick access to interior contents. Foam-padded walls, lockable zippers and the included padded pistol rug deliver additional security and guard against impact during transport. The bag includes an ID name strip panel for quick identification. The spacious design and impressive volume guarantee this Uncle Mike's bag is the perfect companion for tactical personnel or firearm enthusiasts.